When you live in a big city like London, it can feel like you're a million miles away from nature and the great outdoors. Eating organically or growing your own produce seems like something they only do in far-flung, wild places… like Scotland. However, embracing the outdoors and picking your own fruit and veg is easier (and closer) than you might think. Lying less than an hour or two away from the centre of London is a great range of farms that let you pick your own fresh produce to take home and eat. You can get everything from berries to beans, which you can make into healthy and fresh meals or devour straightaway. There are loads of benefits to picking your own fruit and veg, like teaching the kids about where food comes from, or making sure that the fruit you eat has the highest vitamin count (it does when it is picked fresh). It is also just a relaxing and fun day out that can take away some of the stresses of city living. So to help you get closer to nature we've made a list of the best places to pick your own fruit near London this summer season. Parkside Farm offers a pick-your-own period between June and October and boasts that their products are 'as fresh as it gets'. They have top level strawberries waiting to be grabbed along with most other types of berries. There are also vegetables on offer like spinach, courgettes, beetroot and more. The farm is located in Enfield and is positioned just one mile away from the nearest railway station. You might even spot a Spice Girl. Parkside Farm, Enfield, open Jun-Oct. 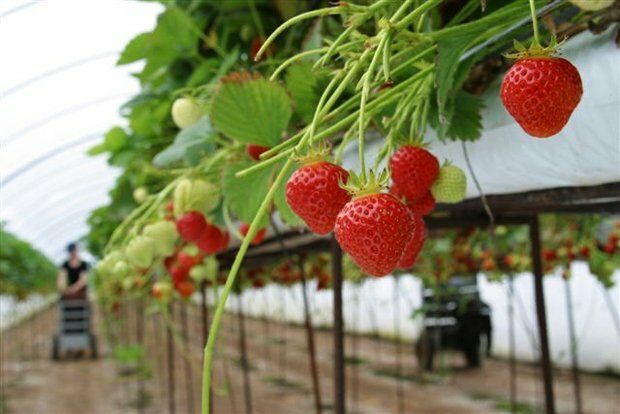 This pick your own fruit farm lies on the outskirts of Bromley. A day trip will transport you from busy city life to tranquil country living in the blink of an eye. The business is a family affair and you can buy berries, spinach, Swiss chard and currants along with offerings of peas, broad beans and courgettes. If you can't make it this summer, the farm is open year round for visitors. So why not pick up a pumpkin in October or Christmas dinner vegetables in December. Hewitt's Farm, Bromley, open year round. Hawkswick Lodge is only a 20-30 minute train ride away from Central London. To enter you have to pay £2.50 and then you are free to pick until your heart's content. The farm insists that picking your own fruit is cheaper and tastes better because you cut out the middleman. It also advises you to freeze some of your goodies for the winter as the fresher the berry is, the better it tastes when defrosted. Hawkswick Lodge Fruit Farm, St Albans, open Jun-Aug. The UK's largest pick your own farm grows 28 crops in a whopping 76 different varieties. On arrival you have to chose between a 1KG or 3KG punnet, then you pay by the kilo. This farm is fancier that your average fruit farm, boasting a pool and spa which you can wind-down in after your day picking. As it is a bit further out of the way than other farms near London, Garsons recommends that you reach the farm by car. Garsons Farm, Esher, open Jun-Oct.
At Cockforbridge Farm, alongside strawberries, raspberries and gooseberries they also grow yummy rhubarb. From May to September they offer 20 different crops to pick. Just remember not to eat any as you go around as this is strictly forbidden – after all, the farmers have to earn a livelihood. The farm is close to Heathrow and could be a fantastic way to spend a layover. Otherwise, you can get there from Central London in less than an hour by train or bus. Crockfordbridge Farm, Addlestone, open May-Sep.